Sunday, April 21, 10:00 a.m.
Thursday, April 18: Maundy Thursday with Soup Supper, 7:00 p.m.
Friday, April 19: Good Friday, 7:00 p.m.
Saturday, April 20: Great Vigil, 8:00 p.m.
Sunday, April 21: Easter, 10:00 a.m. It was there in the home of his very close friends, Mary, Martha, and Lazarus, that Jesus’ coming death was anticipated and greeted, not with denial or protest – as by the men who traveled with Jesus – but with tender compassion. Lazarus, after all, had good reason to know a lot about dying from personal experience, having been there, remembering awakening to the smell of the earth tomb in which he had been buried and the shocking gleam of light from the opened door. And Mary and Martha, his sisters, had been through the passionate grief of bereavement, and were no strangers to loss and death. So I like to think that in their household, Jesus could be most human as he looked toward his own death – and could find tender care with those friends who would not change the subject, or fidget and look away, whose anxiety and fear would not rise up to add to his own. The text tells us it was spikenard (balsam – that evergreen forest fragrance) and myrrh with which Mary perfumed Jesus’ feet that evening. Balsam is a fragrance for healing; and myrrh is a resin used to prepare the dead for burial – and when Jesus smells these, he makes the association at once. Like those myrrh-bearing women who will come to his tomb to prepare his body after he has died and the Sabbath has passed, Mary of Bethany is one of the women whose response to death is to give kindly care – to lay on hands, and weep, to wash and wrap, and do what is proper to honor the dead. At this point in Lent on the threshold of Holy Week, we take a deep breath and prepare to accompany Jesus once again in heart and mind on that journey through his suffering and dying, and into resurrection. It is always a practice for our own journey on the same path. And if there is a part of us that would like to avoid the subject, just skipping over the hard part right to Easter, our own inner wisdom will tell us, correctively, that it is soul-work to prepare for our dying and look it in the eye, to consider our death, walk around and inspect it, make its acquaintance, even perhaps befriend it. we owe it to God to come close and see what the Holy One has done for us, even the part that is not pretty. None of us gets out of this world alive. None of us gets to Easter save by Good Friday. But what if grace comes to us, not only at the end of the story, but also along the way? What if our walking with Jesus and in the knowledge of our own dying draws us deeper into the heart of God, and becomes the very place from which our strength will flow, our courage for our own loss and dying, our spring of living water? The Apostle Paul writes of his own new life in Christ as a footrace, a tough endurance race in which he is now sprinting toward the finish. The preparation he had had as a person under the Jewish Law had brought him a long way traveling in a good path of being right with God. But then a new lap of the race opened before him through Jesus Christ, and this was what allowed him to become ready to lose everything, to be strong in the awareness of his own coming suffering and death, and even to press forward eagerly, knowing what was ahead, because of the prize of his heavenly calling next to which everything he is losing seems worthless -= dog-dung he graphically calls it. In Bethany, perhaps that moment of kneeling to touch Jesus’ feet was – apart from a goodnight greeting—the last time Mary was to handle the body of her beloved friend. And Martha, as always cooking and tending to the details of hospitality, was preparing the last meal she would serve him, and Lazarus was pouring the last cup of wine he would be able to offer his friend. The sweet moment of presence, touched by the bitter moment of coming absence! For us, too, comes the last touch, the last meal, with those we love who have died before us, and finally the last connection with those whom we will leave as we cross the threshold of our own death. And who will anoint our bodies tenderly and say goodbye to us when the time comes? Who will wash our bodies and wrap them for burial? Who will gather around us to pray and commit our remains to the earth? What will be said of us? What will be remembered? It is not morbid to reflect on these things. Nor is it macabre to look at the suffering of Jesus in this season. What is morbid – that is, what brings less life, rather than more – is to see the suffering as an end in itself, to let it become the subject of our fascination so that it hides the person of Jesus from us, rather than revealing him. What is pornographic – base, common, demeaning – about the torture of the man Jesus, is to watch it as though his suffering was spectacularly different from the suffering of all human beings, rather than to see in it his deepest humanity, his closest connection with us in our own suffering and dying human bodies. Jesus was not Hercules, not Prometheus, not a superman-god doing super-human suffering; he was a fully human person enduring human suffering humanly as was his divine calling as God’s beloved Child. And today we glimpse him taking some of the last physical comfort he would know, sharing a meal with friends, listening to their voices, enjoying their conversation, perhaps too their laughter and stories, and looking in their eyes, letting their hands of love touch him, feeling Mary’s tears and the brush of her hair on his skin, breathing in the spicy scent of nard and myrrh and Mary’s own scent close to him. All this becomes a preparation, a fortifying of his heart for what is to come, as the tenderness of our loved ones is for our fortifying and comforting as well. In Christian tradition is a thread that knows Jesus as the midwife of souls, the one whose hands will catch us as we slide out of the dark passage into the light of new and eternal life, the one who will give breath to us then, as we were given breath when we entered this life. We are to hold in mind always that Christ knows the way we are going, has traveled it before us. Through Jesus, the valley of the shadow of death is a road into the very heart of God, where we shall not be left alone but find ourselves companioned and welcomed through that farther door. 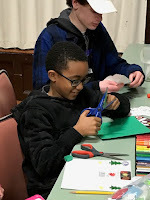 This is St. John's Episcopal Church... please click on photo below to see more photos of church life! This Lent this year we are invited to participate in a Tuesday evening 7 p.m. Bible Study program called "It is time to Stop, Pray, Work, Play & Love." This is a video series and accompanying workbook from the Brothers of SSJE designed to help people with their sense of time, achieve balance and embrace Sabbath wisdom. Join us at the rectory for a light supper and wonderful discussion! Saturday, April 27, 1:30 - 3:00 p.m.: ﻿Presiding Bishop Michael B. Curry will meet with Middle and High School Youth from around the Diocese! Please let Emily know if you'd like to come because we need to register by April 22. We need your talents for the St John's Harvest Moon Arts Night next September. Plans are in the very early stage,. We envision an art exhibit in the Narthex, a poetry reading with open mic signup, maybe dance, instrumental music, song, finger food and wine and sparkling cider, and a silent auction of donated art, from paintings to poetry books. We also need volunteers to design a flyer and poster, handle publicity on social media and in local news outlets, help with planning, managing and organizing the art, to do setting up and breaking down of the exhibit, to organize the silent auction, to help with the food and drink, and to do cleanup. If you are an artist, let me know about your talent. If you are a master organizer, or helper, we need you, too. Many hands will make light work! Oasis Ministries –we cook and serve a monthly hot chicken dinner to about 100 homeless neighbors in downtown Boston on 2nd Mondays. Ecclesia outreach – we invite homeless and poor neighbors from Boston to Hale Reservation for a summer picnic and for a Spring bowling afternoon in Norwood. Tutoring – after-school reading and homework help for city children at Church of the Holy Spirit, Mattapan on Tuesday afternoons. Pantry support – for the Westwood Food Pantry and the Center for Life elderly housing complex in Mattapan – bring non-perishable groceries to church year round. Habitat for Humanity home build – coming soon, a St. John’s team to help build an affordable home in Westwood. Prayer Shawls – knitting group prayerfully makes shawls for people facing illness or crisis. Urban Promise Honduras – missioners from St. John’s & CHS travel to learn and work with children at a school in Copan every few years. Boston B-SAFE summer program – our team works during a July week each year to provide meals and a field trip & picnic for this large city children’s program. Eucharistic Visiting – members are trained and take the Sacrament, offer healing prayer, and make friendly visits to people who are homebound, in hospital, or other institutional settings. Speak to Rev. Jennifer if you’d like to put your discipleship to work in one or more of these parish ministries!